Your No. 1 Source for the GREATEST COMIC STORIES! WELL LET'S GET CONTROVERSIAL NOW, SHALL WE? A highlight from our kamikaze raid on the San Diego Comic-con 2017. Lynn doesn't hold any punches when I bring up Colletta. Being a Kirby guru and probably next of kin at this point, Lynn's perspective is astute, educated, well read, memorized, and dare I say "fanatic" about the King of Comics. So it naturally begs the question: Who might be considered Kirby's Arch-Nemesis then? If Kirby drew it, this guy erased it. If Neal Adams wouldn't let the man in the same room as his art and had to redo one of his pages because that standard wasn't adhered to, we are closer. If Gil Kane says this man was his 2nd favorite inker only to "anybody else" being his first, we have a winner. 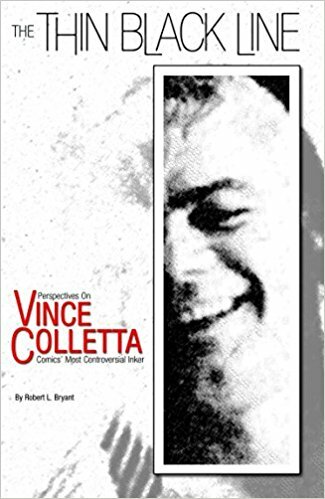 A staffer at the Two Morrow's publishing booth handed me this book and with a knowing smile let me know I was being asked to partake in something that gets under the skin of a lot of comic creators: a biography of the infamous Vince Colletta, inker at large. I assured Lynn a portion of the proceeds would go to Colletta's estate, and that Colletta probably wouldn't be able to enjoy any of it. Lynn's response, (not verbatim), "not while burning in hell at least..."
It only made me want to read this even more, so that's what I'm doing now. Chapter 3 and like Walter White, you can already see how one's life builds to become who this man was when he passed. I'm excited to finish it so we can have a discussion and even open each others minds moreso. I know it'll be like talking Salman Rushdie into writing a sequel to the Satanic Verses when getting Lynn to empathize with Colletta, but that's not my goal. I think I'm looking for a balanced diet of information so I can make my own conclusions. Thank you for posting! Let's see what others reply! I really thought Conan 2 was Roy's Conan, not Howard's, but that was a huge improvement. My biggest problem with Conan 1 was that he was a slave for so many years. Howard's Conan became Conan by being free. Such slavery would have domesticated him, and Howard's Conan would have escaped and killed his captors or die trying. I'm short on time. I'll add more later if I think of something worthwhile to say. p.s. Love the picture. Ahnold is so tiny! First movie - something no Howard story ever was: slow and tedious. Filled with great scenes that were dragged down by nothing scenes, the movie left us feeling as if we had watched a series of still pictures. Dino always talked about how people would feel real emotions in his versions of movies. (Most notoriously with King Kong: the Expensive Error) We never felt any emotion in the first movie, even with the Belit swipe. The closest was a sense of awe watching the boring and bored boy exercising at a mill and becoming a bored and boring Arnold. Even that sequence was lifted from (of all places) the Three Stooges Meet Hercules. 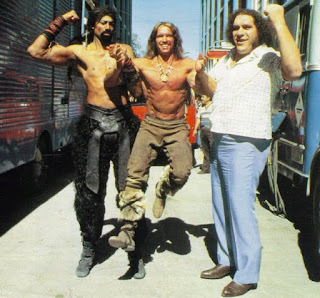 At least Arnold looked like Frazetta's Conan. Conan 2 was such an improvement that it's the only movie with Howard's Conan in it. Conan Remake - no desire to see it.